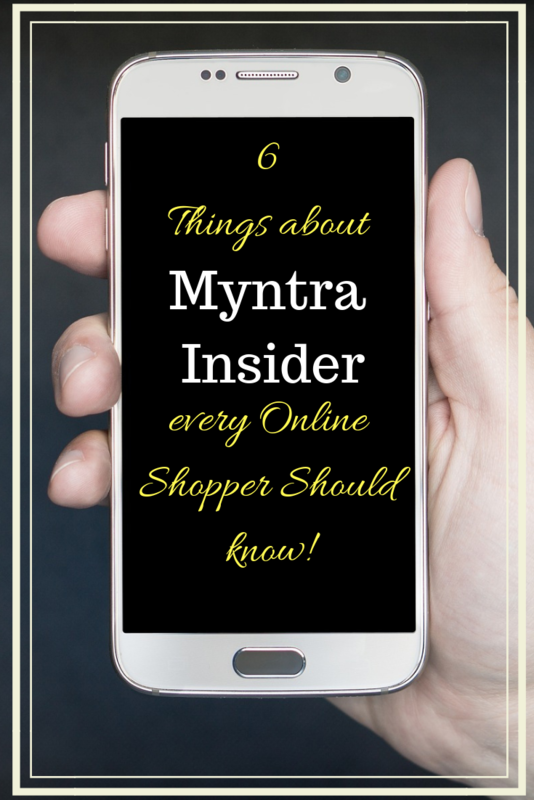 6 Things about Myntra Insider every Online Shopper Should know! Myntra has recently started with its Myntra Insider program and the game just got a lot more interesting. Everyone loves Myntra for many reasons! The great quality of products, quick deliveries even before the expected dates, even quicker returns and refunds and finally, there is genuine, good quality material. Now, who doesn’t like that! What is the Myntra Insider Program? For every 10 rupees that you spend on the platform, you earn a point for the Insider Program. So, on a purchase of Rs 250, you get 25 points. You can join the program for free (isn’t that amazing!) and use the points to avail many more offers and discounts. These offers and discounts are listed in the ‘insider’ section of the Myntra app. How is Myntra’s Insider Program a game changer? Loyalty points and loyalty programs for recurrent customers is not a new thing. But what makes Myntra Insider a game changer?? Read on to know more! Usually, loyalty programs are a pain, simply because everything they have as rewards costs a lot of points. You need to have thousands of points to buy something that is worth just a few hundred. A lot of times it is very frustrating and users stop checking on the points or using them at all. With Myntra Insider, there are offers and discounts are seamlessly integrated with various niches with zero hassles in availing them. Many a time, loyalty points tend to give you a very restricted list of options to redeem your loyalty points. Myntra Insider points can be redeemed for food, beauty services, entertainment, car services, discounts or premium memberships from Myntra’s partners like Zomato, Hotstar, Zoomcar and so on. There is a huge variety of things you can do with the insider points. You can also avail more services on Myntra like free delivery on items that won’t ideally be delivered free. There is no tedious back and forth to redeem the points. No card swiping and no number generation. Just as you select a service to redeem your points, you can simply click on it and redeem your points. You do not have to do multiple transactions or a lot of expenses to earn points. Insiders get 1 point on every 10 rupees spent on the platform to purchase a product. You also get a lot of activities to do that help you earn points daily. As you keep earning points and spending points, you get to upgrade your tier. So, with no points, you are in the Insider tier. With 250 points, you get into the Select tier. With 2000 points, you become the Elite tier and with 5000 Insider points, you get to the Icon tier. Each tier has added benefits like priority customer support, early access to upcoming sales, becoming a Myntra style influencer and even being featured on Zoom TV. You can come face to face with your celebrity, by using a brand endorsed by them (like HRX by Hrithik, and I so wish to meet him!) You can participate in contests, become a Fan council member and suggest fashion tips/ideas to Myntra among other benefits. With the Myntra Insider program, Myntra has given us umpteen reasons of being an avid fan of their services, just in case we weren’t anyways! So, head over to Myntra and click on the insider tab. Register for the Insider program for free, and then as they say – Happy Shopping!! If you liked this article, do SHARE it ahead! I’ve been in two minds about the Myntra Insider and your blog post has really helped me decide on going ahead with it. I mean, this is going to make shopping super exciting now! Wow Myntra insider has some really cool benefits for customers . I have shopped from Myntra online before but need to explore more soon and should join the Program too. i love to shop from myntra, but never used the myntra app. I think i should download it now. Its quite interesting. They are giving so many things. Will check this in detail with my Myntra account. I have got an email from them also. I am signing up for this program. I am a shopaholics and myntra is my go to place for clothes and accessories. Amazing and beautiful post. Myntra Insider program is so exciting and impressive. There are varied offers and discounts of any categories. Great thoughts.